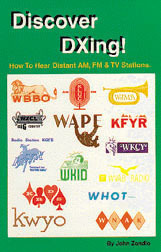 Here is a great introduction to DXing the AM, FM and TV bands. Topics include: propagation, seasonal conditions, equipment, antennas and reference materials. Chapters on: suggested radios for AM DXing, best bets for hearing 50 states on AM, clear channel AM stations and VHF TV stations by channel. Third Edition ©2006 Universal Radio Research 96 pages. This informative book will be included FREE with your purchase of a Kaito KA600L from Universal Radio for a limited time. This book may also be purchased separately. Copyright 2017 Universal Radio, Inc.